For some reason, I just love chocolate pudding. Always have, always will (I suppose!). So when we cut out processed food I, of course, ditched the boxed stuff like Jell-O chocolate pudding mix (no thank you artificial flavors and dyes—yes, even in BROWN pudding!) 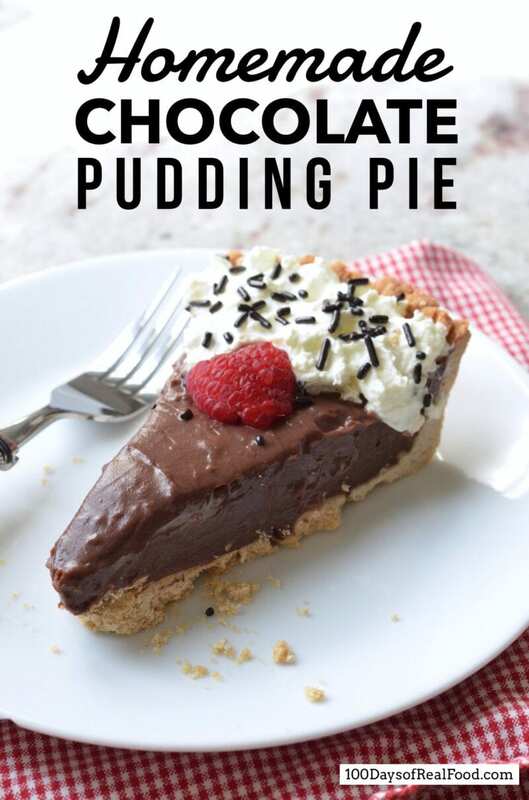 and started experimenting with making pudding from scratch with this homemade chocolate pudding pie recipe. YUM! It was even better than I remembered it, probably because it was homemade this time! Now, we usually shy away from processed ingredients such as sugar and corn starch, but we do also indulge in sweet treats sometimes (about once a week). Made-from-scratch sweet treats are always my preference…so this new recipe definitely fits the bill for those special occasions! 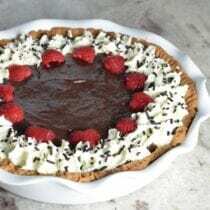 I’ve made homemade pudding many times before, but when I was trying to turn it into the pictured pie for this recipe, I got all sorts of questions from my girls. “What is that?” (They’d never had pudding pie before.) “Why are you making it?” “What’s it for?” And then finally to the main point of all their questions…”Can we have some?!? !” Haha, of course. They were happy to “taste test” for me and were not at all disappointed when I wasn’t satisfied with the outcome the first time and had to make it again. It’s a hard job, but somebody’s got to do it! Haha. In a 9" pie pan, use a fork to whisk together the flour, salt, and cinnamon. Stir in the butter and milk, then bring the dough together with your hands. Press the dough into the pan, bringing it up on the sides into one even layer. Finish the edges with the back of a fork (if desired). Punch holes in the bottom of the crust with a fork (to prevent it from puffing up) and bake until golden brown, about 16 to 20 minutes. Let cool completely before adding the pudding. 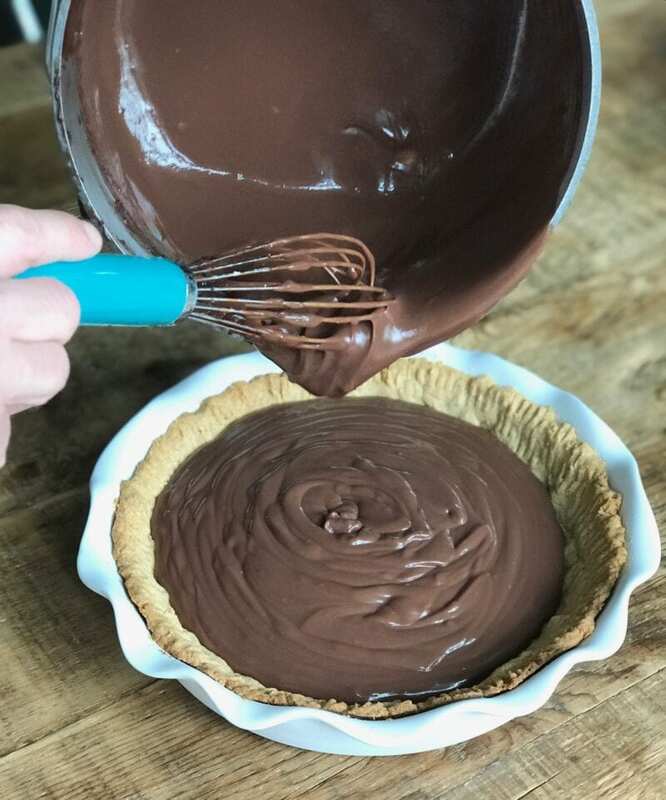 In a medium saucepan, whisk together the milk, sugar, corn starch, cocoa powder, and eggs. Set it over medium heat and frequently whisk until the mixture begins to bubble up. Turn the heat down to medium-low and keep whisking until the mixture becomes thick and creamy, 6 to 8 minutes. It's essential that it's thick enough to set up like a pie, so it's better to be on the thicker side (vs. thinner)! Remove from the heat and stir in the chocolate chips, butter, and vanilla until melted and well combined. Pour into the cooled pie crust, cover with plastic wrap, and refrigerate until set, at least 4 to 5 hours. Can also freeze for 1 hour if you're in a pinch. Combine the heavy cream with your sweetener of choice and vanilla, and either whisk by hand or use electric beaters until stiff peaks form. Can also shake together in a jar with a tight-fitting lid until you no longer hear liquid hitting the sides. 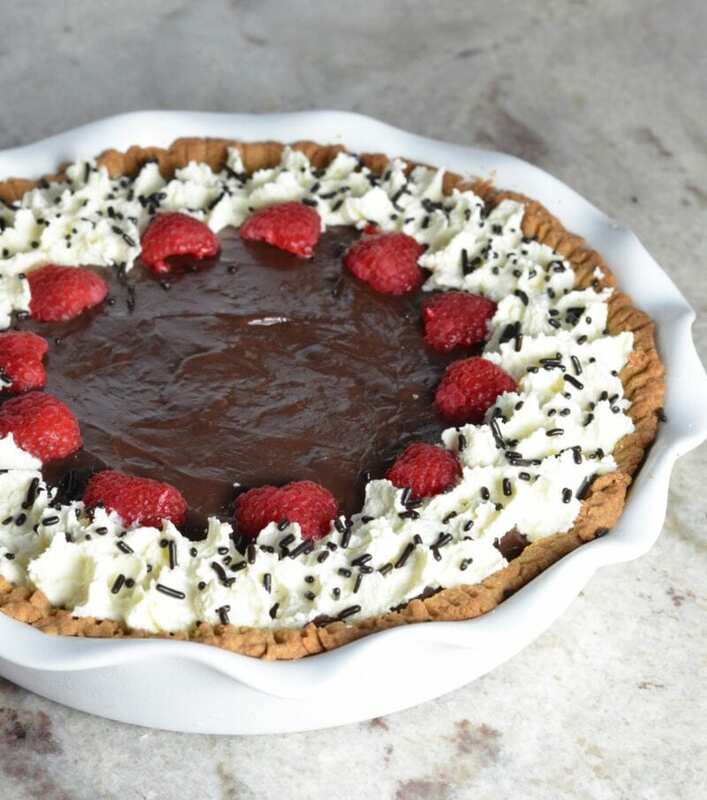 Add as a topping to finished/set pudding pie, garnish with additional chocolate (if desired), raspberries, and serve. Previous Post: « How to Make Homemade Bath Salts! Second time you make this pie will be faster and easier. When in need of a vanilla version, make pastry cream. It is so much better then pudding, especially when vanilla beans are used. Also, homemade pudding can be substituted in many recipes that call for instant. I make it ahead, cool slightly or throughly in fridge (depending on recipe and cover with plastic wrap to avoid skin forming). If necessary, whisk pudding before using. Refrigerating the crust for 15 minutes before baking avoids shrinkage (just cover well with Saran Wrap so it won’t dry out). Before baking, line crust with parchment and fill with pie weights or dried beans to keep crust from puffing up. Have you experimented with tapioca starch? What are your thoughts or preference for cornstarch versus tapioca starch? Hi Lisa. Is there a plant based substitute for the whole milk? Do you think almond or cashew milk (only filtered water/nuts) would work in place of the regular milk? I’m surprised you boil the mixture for 6-8 minutes. Boiling this long can break down the proteins and you end up with soup that never sets. Usually you don’t boil any longer then two minutes. I use 4 egg yolks in my pie. Doesn’t matter. 2 eggs is good. But here’s a trick. Mix the egg with some of the milk before mixing with dry ingredients etc. Then pour the egg/milk mixture thru a wire screen thingie. Gosh darn it, forgot what its called. (I’m old lol) Kind of like a wire colander on a handle. Doing this will catch any of the white stringy things in the eggs, thus having one creamy pie. Refridgerating pie crust 1 hour before rolling makes it easier. And you can roll the crust out between two big pieces of Saran wrap, then remove top layer of Saran wrap, put crust in pie dish and remove other layer of Saran wrap. This looks delicious! Can’t wait to make it for Easter :) Thanks for the fun recipe! This looks completely delicious…as usual! I was wondering if I could sub almond milk for the whole milk? Or would that ruin the pudding consistency. Thanks!